Very useful for late-summer colours in the warm oranges, hot reds and yellows. and they make excellent cut flowers. Hardy once established deeply, they still appreciate winter mulching to protect the early shoots. 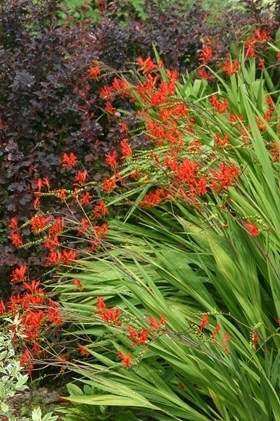 Crocosmias will not flourish on poor dry soil, they must have rich soil and summer moisture. They seem to do better with splitting and relocation at regular intervals. Do order early, in a mild spring they grow away rather early and become very fragile to handle.